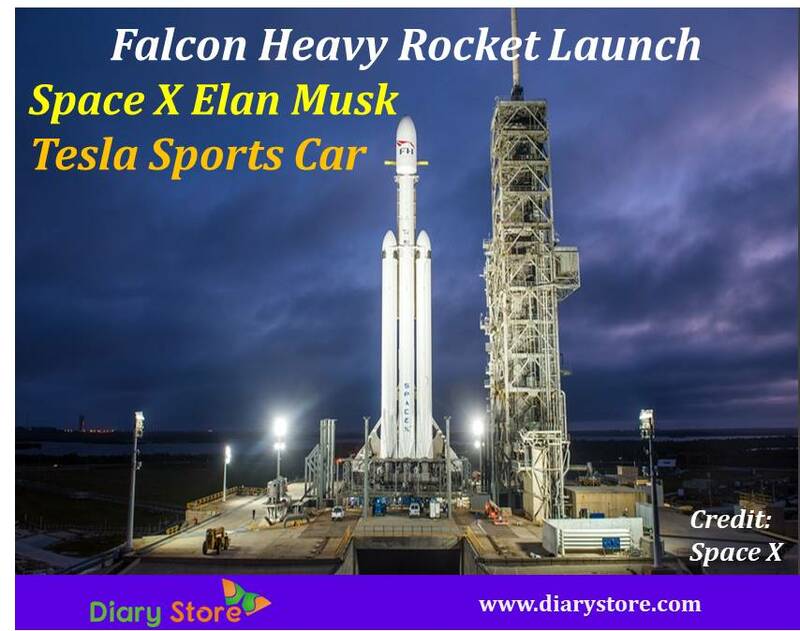 The US private spaceflight company SpaceX, which is of mastodon stature, launched on February 6, 2018, at 3.45pm, E.T., the most powerful rocket “Falcon Heavy” from Kennedy Space Centre, Florida, USA. The most dissimilar feature of the launch was the payload itself which was unconventional as compared to the innumerable predecessors. 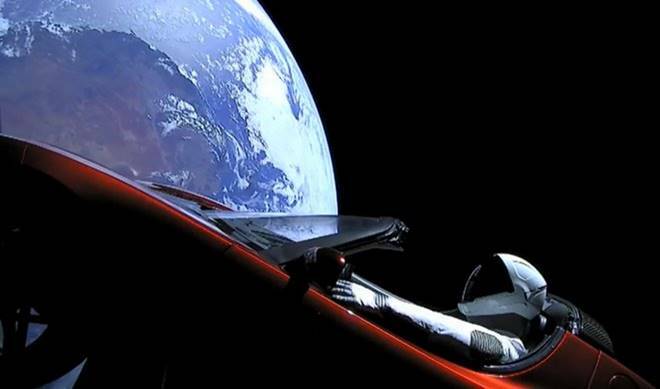 Unlike the usual man-made satellites flanked by scientific accessories, this time it was an old tesla sports car with a dummy mannequin driver, named “Starman” draped in space suit firmly perched in the driver’s seat. From the instagram posted by Elan Musk, it was evident that there was an inscription “Made on Earth by Humans” on the circuit board of the cherry-red tesla car launched by Falcon Heavy. A few picnic-seekers at Cocoa beach, Florida cheered in jubilation when they accidentally spotted the mammoth Falcon Heavy lift off with unbridled force to shoot into space leaving a spiraling trail of smoke behind against the backdrop of endless blue sky. The most exciting feature of the launch was the image of crescent-earth (not crescent-moon, as we normally speak of) was observed in a continuously diminishing size in the rear view mirror of the vehicle. 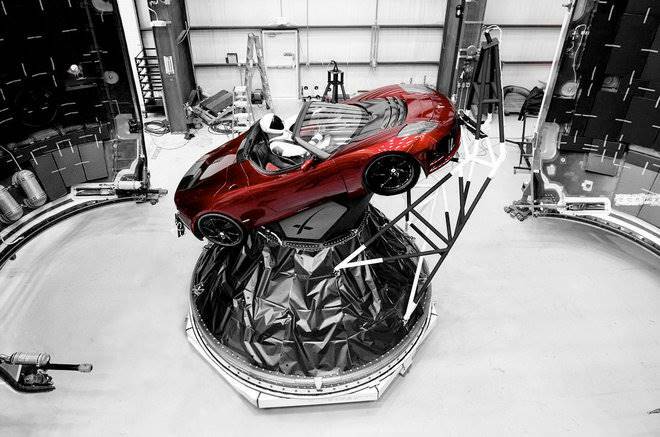 The main objective of the launch was to send the tesla sports car much deeper into space beyond the gravitational pull of Jupiter. Elan Musk, the CEO and Chief Designer said that the vehicle might not face any hardships in its journey when it crosses the orbit of Mars on June 8, 2018 but it might encounter turbulence near the realm of Jupiter. 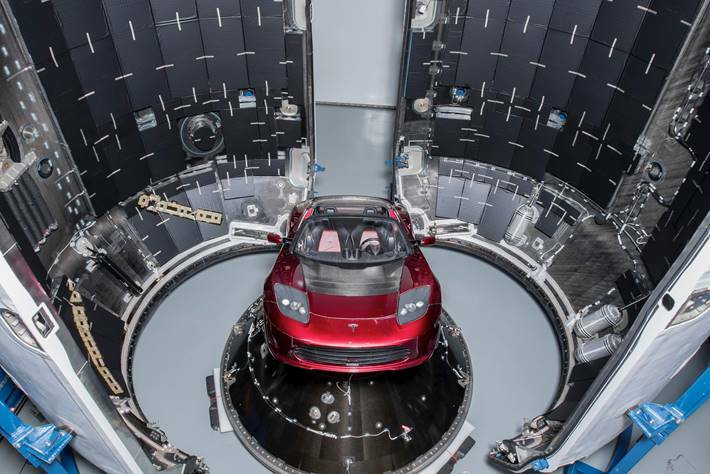 Elan Musk expressed hope that the car would remain in space for millions of years and this could be seen as a primitive step for aspiring humans to set up habitable abodes on the red planet. Out of the three boost segments, the two flanks got separated after they lent contributory support for the main booster rocket and returned earth safely and got themselves planted in their respective slots on earth. However, the middle main booster rocket after releasing its anterior part further into space, failed to land on an ocean platform as planned, since the tesla payload was found to have overshot its target. The experiment of sending an automobile used by humans with a mannequin in it might have surged up from an underlying idea in the minds of scientists that there could be a very faint possibility of the tesla payload descrying the attention of aliens that have been elusively nagging the minds of humans. Since the stint of the payload is hoped to be for countless number of years, it may spur up further space ventures in future with more sophisticated scientific payloads and guide the aspiring space travellers in their upcoming endeavours.